Business intelligence software is essential for companies to gain perspective regarding their business operations. The phrase business intelligence also includes the transformation of unstructured business data from various internal sources to create reportable data sets. These can then be used to come up with tables and graphs that provide valuable insights. In need of such kind of a software that can help your business identify invaluable insights? 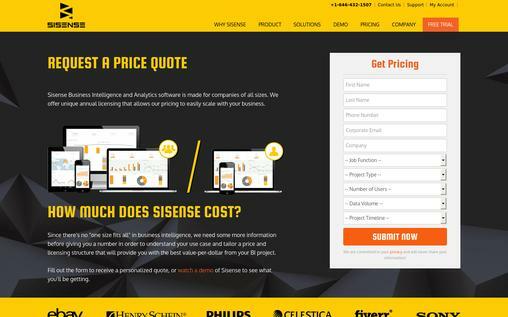 Sisense is a business intelligence software for end-to-end businesses, purposely built for use by all types of users including those without prior experience in BI software. It’s a full application suite offers business managers and owners with tools needed to support and manage their business data through analytics, reporting, and visuals. This software is quite straightforward to use and does not need lengthy implementation and training, thus businesses can set it up and running very quickly. Sisense includes functionalities for dashboards, scorecards, data warehousing, report writer and ETL (extract, transform and load). Every management happens on a single interface designed with an end user in consideration. It can be deployed over the cloud or on-premise. It is built for businesses across all verticals and industries, currently deployed into use by hundreds of known organization including ESPN, eBay, Merck, and Intuit. A user interface is a drag and drop enabled. It features several useful widgets including charts, graphs, and gauges. Has a couple of eye-catching visualizations. Eliminates the limitation of data size. Ad hoc analysis of large size data is enabled. Consolidates, stores as well as accumulates data. Supports various data exports, including CSV, PDF, images and several more. The dashboard is interactive and browser based. Can be integrated with external applications or websites. Critical metrics are identified through calculations and filtering. Data is filtered by dropping fields on canvas. Employs a single-sign-on to maintain its single authentication technique. 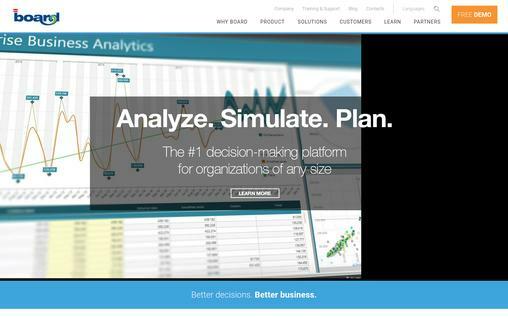 Sisense is a great BI solution with features that put it ahead of competitions. You can view the demo before choosing to make a purchase. 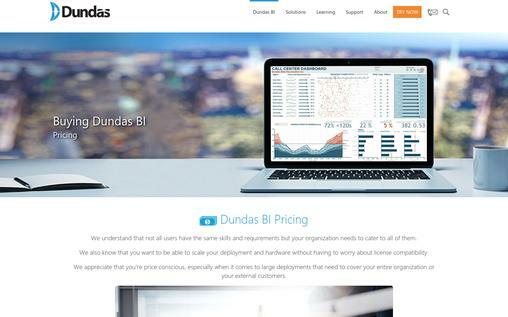 Dundas BI is an intuitive business intelligence as well as a data visualization software design by Dundas Data Visualization. It is equipped with a great feature that makes it an ultimate solution to a wide range of businesses. It has been integrated with dashboards, data analytics, and reporting tools. It makes it possible for end users to come up with their own customizable and interactive dashboards, implement ad-hoc queries and analyze their performance metric and data. With its intuitive interface that has touch support, it facilitates creation and viewing of dashboards on a wide range of devices including smartphones and tablets. It is built for various company sizes as it can be hosted on-premise or via the cloud for various industries including hospitality, banking and finance, education, construction, insurance and many more. It is suitable for mid-size and large firms. Some of the clients of Dundas include Coca-Cola, HP, SIEMENS, Microsoft, KPMG and Norwegian among many more. Dashboards and reporting –this lets you create highly customizable dashboards, scorecards and report within minutes by drag and drop. Visual data discovery and analytics – you can obtain insights much faster with a powerful analytical engine. Seamless data integration – this presents a platform that is extensible and fully open, giving you complete control in customization. It comes with the free trial version before purchase. Its pricing is quite flexible as you are provided with a subscription a well as a one-time license option. BOARD is designed to integrate business intelligence, business analytics, and corporate performance management for mid-sized and the enterprise level firms in various industries. It is it is built for banking and finance, government, education, construction, hospitality and many more. Within it reporting functionality, the software allows its users to perform full reporting without any help. The report can then be exported in various formats like HTML, CV, PDF, and more. BOARD also has multi-lingual support which makes it invaluable if you need to create reports in other languages. It enjoys a wide client base from large and mid-sized firm including Gigaset, DIEHL Metering, NEC, RIEDEL and many other. Customizable dashboards – you can create highly interactive dashboards as well as attractive reports. User self-service – it lets you make reports and perform wide data management through a self-service type of approach by the drag and drop functionality. Performance management – you can obtain useful business insights and link it your enterprise’s plan and control cycles. Advanced analytics – this lets you automate the process of complex data mining so as to get better insights on decision making. Solutions to every department – BOARD includes features that make it a good option for any department of an enterprise. By implementing the data collection and analysis features, firms can view their data in a relevant manner that can help in making intelligent business decisions. Halo BI offers a business intelligence software solution with analytics tools designed to cater to the needs of specific industries. Some of these tools include inventory forecasting for the supply chain management and general ledger analysis for the finance industry. This BI system makes use of data from various sources, including the mall and medium sources to create a cumulative business information view. Customizable dashboard – its dashboard feature an easy to use front suitable for self-service without any assistance from IT experts. Data visualization and analytics – this is essential for businesses to gain useful insights by analyzing and assessing various situations. This can be achieved through graphs, charts, sorting, drill down/up and slicing. Performance measure – it is an intuitive platform that facilitates self-service in data discovery and planning to measure performance accurately. Halo BI is a solution worth considering as it makes it easier to identify risks, advantage, and opportunities along the supply chain management. 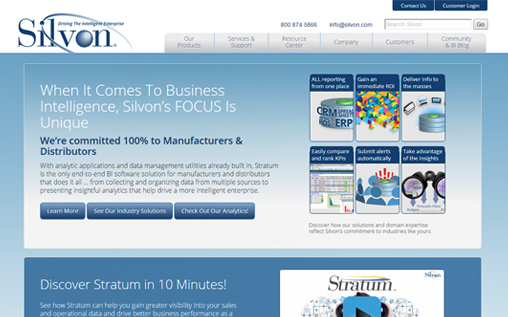 Stratum is a business intelligence software solution by Silvon. This BI software solution does the work of collecting and organizing data from various sources, presents highly insightful analytics as well as data management. It is a fully featured solution for end-to-end businesses specially designed for the enterprise level manufacturing and distribution firms. It features back-office modules, analytic applications and report generation for finance, sales, inventory, purchase plus other important areas of businesses. It can be deployed either on-premise or via cloud by a small and medium-sized enterprise. Analytics – it collects and organizes data from multiple sources to create useful insights and analytics for businesses to make decisions. Reporting –Stratum facilitates the creation of all reports from a single platform. Ad hoc reporting and automatic scheduling of report among other features are supported. Dashboard – It’s highly customizable to facilitate self-service and creation of reports. Performance measurement – it creates great insights that can be used to measure the performance of your business. Trend indicators – this is an analytics feature essential in noting trends in the performance of a business. Silvon has not provided a detailed pricing plan and can only be obtained by contacting or requesting a quote. Birst is BI solution built for the elimination of information silos. This software is availed in two editions, the enterprise and Discovery editions. The latter is more basic suitable for those users who need faster and simple BI solution, that is, small sized businesses. It features dashboard, ad hoc analytics as well as mobile analytics. The Enterprise edition is comprised of all features of the other edition and automated data warehousing, dimensional database management, and data mashups. Birst provides BI solutions suitable for sales, finance, marketing, supply chain, and HR departments. Some of the clients of Birst include Citrix, Motorola, Kellogs, Unilab and many more. 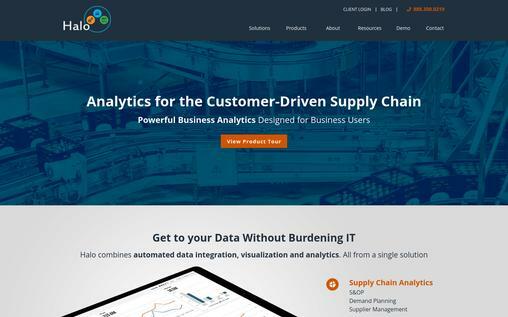 Analytics – Birst enables businesses to carry out ad hoc analysis, predictive analysis, profit analysis, and Online Analytical Processing (OLAP). Reporting – users can create attractive reports through various reporting features including ad-hoc reporting and scheduled reporting. Dashboard – this BI solution has an intuitive dashboard that can be customized in various ways to meet the needs of a department. Trend Indicators – businesses can easily identify peculiar patterns in their performance which can, in turn, be used to gain useful insights. 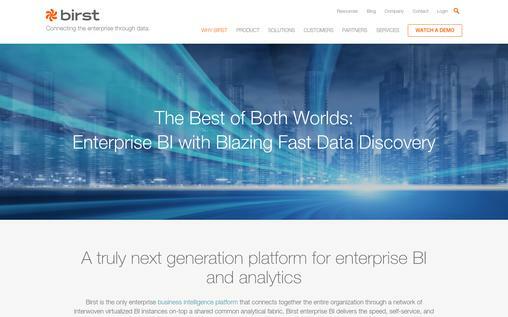 Birst is coupled with cloud’ agility and presents a simple way for businesses to solve their real-life business problem. Birst does not provide pricing plan, but it can be obtained by making a request. iDashboards was built to provide Business Intelligence solutions to businesses that need an intuitive and collaborative method of viewing and analyzing critical business information. This business intelligence software solution is suitable for use by both small and large sized enterprise. It I fit for healthcare, government, banking and finance, manufacturing, retail, and many other industries. It’s available for on-premise and cloud deployment. 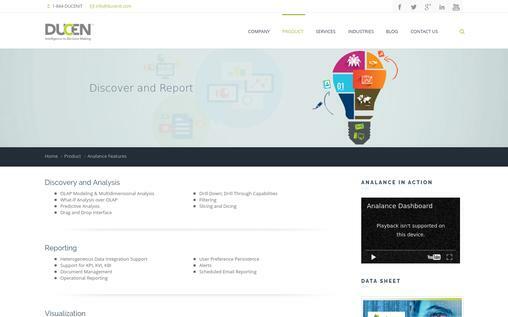 Reporting- iDashboards makes it easier for businesses to create attractive reports. Data visualization – this makes it possible for you to gain useful insights through engaging graphs, chart and tables. Dashboards – the dashboards can be highly customized to meet a particular department’s BI needs. It combines data from multiple sources to create visually attractive and engaging dashboards. Real-time data connection – makes it possible to connect data from various sources in real time. Unlimited viewers – dashboards can be viewed by a wide range of users. 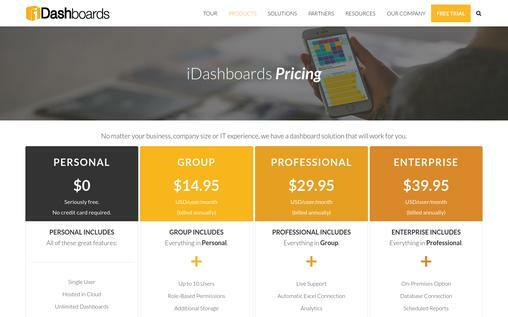 iDashboards has four pricing plans including Personal at no cost, Group at $14.95 per month, Professional at $29.95 per month Enterprise at $39.95 all billed on annual basis. It gives its users a free trial option before making a purchase. 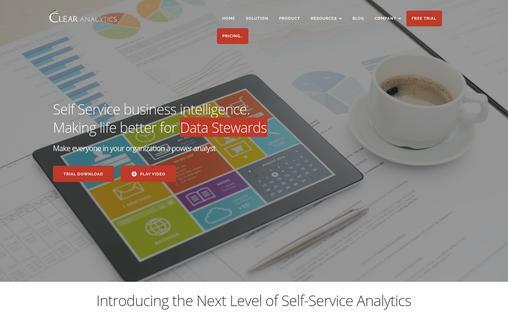 Analance is an end-to-end business intelligence solution designed by Duncan and equipped with a full range of application and feature to facilitate effective analysis of data. It implies provide a simpler way for businesses to make key decisions and increase their performance. It is equipped with an easy to use dashboard and scorecards which are shareable with various departments through drag and drop feature. Users are able to customize risk and quality indicators as well as key performance to come up with more relevant information. It best suits mid-sized and the enterprise level firms across various industries including healthcare, finance, manufacturing, and supply chain among others. Analytics – Analance can be used to gain a lot of insights through various analysis including OLAP, predictive analysis, slicing & dicing and more. Dashboard – the dashboard I highly customizable and can be managed simply using drag and drop feature to suit particular needs of a department. Reporting – Analance offers a wide range of reporting features including the support for KBI, KPI and KVI, operational reporting, schedule reporting, document management and more. Data visualization – this is facilitated through intuitive dashboards, scoreboards, crosstab reports, rich and dynamic graphics. Rapid deployment – the system is pretty straightforward can be deployed with simplicity. Portal usability – the portal features a number of great features that make easily usable including, Single sign-on, bilingual support, support for Saas cloud model and more. Ducenit does not provide a pricing plan for Analance, but users can receive a quote by making a request. Clear Analytics is a business intelligence software solution based on Excel and provides users with various BI specific features for generating, automating, analyzing and visualizing key data. It allows integration of data from various sources and within Excel. All data, information, and report are availed in real time and are downloadable into spreadsheets. It works well for a wide range of industries particularly the real estate, banking, and insurance firms. Some of its clients include AIG, Bank of America, Citibank, Ultimus and many more. Analytics – Clear Analytics presents various ay for users to gain insights through analytics, including ad hoc analysis, predictive analysis and profit analysis. Customizable dashboards – this BI solution boat of a highly customizable dashboard through which users can generate reports and perform other management function by drag and drop. Reporting – several reporting functionalities are supported, such as Ad hoc reporting, automatically scheduled reporting and more. Support for CSV – since Clear Analytics I mainly based on Excel, it facilitates export of data through various format supported by Excel, including CSV. Even though it has robust features and interface, it’s not suitable for those firms that do not use Microsoft Excel. Pricing plan include a 30 day free trial and is available for on-premise deployment only. 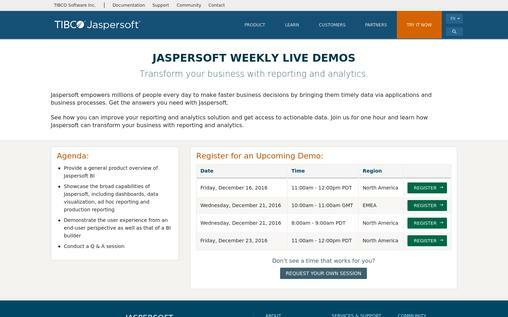 Jaspersoft is a self-service Business Intelligence suite that best suites small to medium-sized enterprises. It features a lot of features including in-memory analysis support which facilitates processing of complex analytical problem much faster. It is also equipped with various visualization features such as dashboards and interactive maps for easier tracking of business metrics. It also features an audit logging capability that actively records reports. Jaspersoft offers the on-premise and cloud deployment options with mobile device compatibility. Reporting – takes data from multiple sources and offers it through easy to read report formats for business. It supports the creation of ad-hoc reports and printed format and for mobile devices. Analytics – Jaspersoft makes it possible to manipulate and data size using its OLAP and in-memory analytic methods for better and quicker decision making. Dashboards – it combines data as well as a graphic indicator to come up with information summaries so businesses can act faster. Data integration – it can load data from various sources using its ETL method to create a data mart or warehouse for analysis and reporting. Pricing options are availed based on your desired number of cores. It also features an hourly subscription plan with no limits on data and number of users. There you have it – 10 best business intelligence software solutions to help you make informed and quick decisions for your business. Each has its own ways through which a business can benefit from. You might want to review a number of them before choosing one that meet your budget and needs.